Mak’s Chee, the brand new restaurant that cooks up near 100 years old authentic prawn wonton noodle recipe made famous by Guangzhou’s King of Wonton Noodle, Mak Woon Chee is now in 1 Utama (Lot LG 311D, opposite Cold Storage).With the opening, Malaysian foodies can now enjoy the signature Mak’s Chee wonton noodle, prepared by Michelin Chef Johnny Yu who is also the first grandchild-in-law of Mak Woon Chee. We had tried their signature is this Sea Prawn Wonton Noodle Soup, or known as ‘Sai Yong’ (with this term as the wonton is hide under the noodle) @ RM12.90. 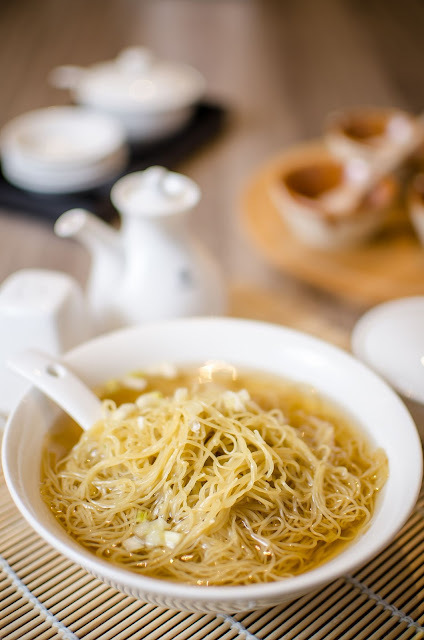 Soup is rich in flavour as it is prepared from dried sole and pork bones. Serve in a medium small bowl which is the tradition that hide this big 4 wonton underneath it. Skin is not thick as you can see the colour of the prawn and pretty generous in ingredient. With the springy noodles and the huge wantan. Portion wise to us is pretty small. One of their signature and one of my favourites from Mak Chee’s. With the generous of prawn roe sprinkled on top, the wantan noodles comes simply addictive. The fragrant of the prawn roe in the springy noodles indeed irresistible. Braised for hours, Mak Chee’s is pride for their braised beef briskets as they were the best sellers in Hong Kong. Tender and moist texture, the beef brisket is something you must have here.